George Washington will always be counted amongst the greatest citizens of the United States, for any number of reasons. My heart may lie with Franklin, my spirit with Jefferson and my mind with Hamilton… but Washington lays claim to my respect, for any number of good reasons. The first President of the United States was far from a perfect man, as is true of any of us, but his contemporaries saw in him a rare nobility of character that distinguishes Washington still today. Last year, I came across a list of rules for civility and decent behavior that were ascribed to him by the editors of Foundation Magazine. Their origin? 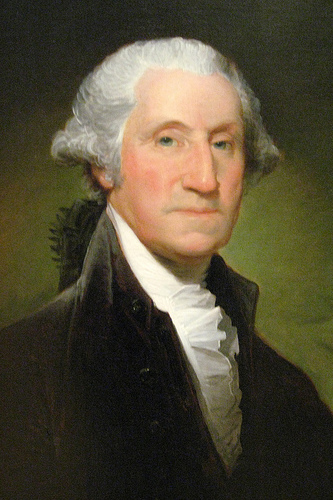 “By age sixteen, Washington had copied out by hand, 110 Rules of Civility & Decent Behavior in Company and Conversation. They are based on a set of rules composed by French Jesuits in 1595. Presumably they were copied out as part of an exercise in penmanship assigned by young Washington’s schoolmaster. It struck me as a worthy mental exercise to adapt each to the present day online culture. The following “rules” are interpretation of his intent, not President Washington’s words. Make of them what you will and share them as you like. Note Bene: As I observe below, everyone will use social media differently. A given person’s position, industry or context may mean a given suggestion doesn’t make sense. And as my friend Paul Gillin has written, it’s important to recognize when to avoid using social media. As we look ahead to the new year ahead, astute observers may even ditch “the s word” in favor of collaborative media. I’ve commented that I’m open to that terminology when if it comes into wider use. On the left is Washington’s original phrase. To the right, my interpretation. Every Action done in Company, ought to be with Some Sign of Respect, to those that are Present. Every public update to social networks should be made with respect for your audience. When in Company, put not your Hands to any Part of the Body, not usually Discovered. When you’re on the webcam, keep your hands above board and out of your nose. Show Nothing to your Friend that may affright him. Don’t post NSFW pictures or links to them on the enterprise social network. Or mask them in links on public ones. In the Presence of Other, Sing not to yourself with a humming Noise, nor Drum with your Fingers or Feet. Don’t hum on conference calls or on Skype, nor tap on the table. If You Cough, Sneeze, Sigh, or Yawn, do it not Loud but Privately; and Speak not in your Yawning, but put Your handkerchief or Hand before your face and turn aside. No coughing, sneezing, sighing or yawning while on a call. Unless you’re on mute. Sleep not when others Speak, Sit not when others stand, Speak not when you Should hold your Peace, walk not on when others Stop. Stay awake in meetings, bring enough chairs, listen first, don’t stay and chat on empty IRC threads. Put not off your Cloths in the presence of Others, nor go out your Chamber half Dressed. Avoid NSFW avatars on public social networks, or bathrobes on Web conferences. Spit not in the Fire, nor Stoop low before it neither Put your Hands into the Flames to warm them, nor Set your Feet upon the Fire especially if there be meat before it. Don’t bury shared bandwidth during the day with P2P filesharing. Don’t dry out your socks in the office microwave. When you Sit down, Keep your Feet firm and Even, without putting one on the other or Crossing them. Ergonomics will help Web workers avoid repetitive stress injuries. Avoid slumping, position keyboard properly. Shift not yourself in the Sight of others nor Gnaw your nails. You don’t need that fourth Red Bull. Nail clippers are a helpful gadget to be used at home. Easy to type with shorter talons. Shake not the head, Feet, or Legs roll not the Eyes lift not one eyebrow higher than the other wry not the mouth, and bedew no mans face with your Spittle, by approaching too near him when you Speak. Truly listen first to what someone else says or read it through with care. Avoid instant “WTF” or “FAIL” comments. Respect the intellect of others. Kill no Vermin as Fleas, lice ticks &c in the Sight of Others, if you See any filth or thick Spittle put your foot Dexterously upon it if it be upon the Cloths of your Companions, Put it off privately, and if it be upon your own Cloths return Thanks to him who puts it off. If you must block spammers and trolls, do so quietly and without malice. Inform the community moderator and move on. If you see the opportunity to vote down nasty comments from a discussion thread, do so for the community’s sake. Turn not your Back to others especially in Speaking, Jog not the Table or Desk on which Another reads or writes, lean not upon any one. Be mindful of generational or vocational differences around the use of smartphones in person. Don’t lean on the keyboards of others. Keep your Nails clean and Short, also your Hands and Teeth Clean yet without Showing any great Concern for them. Keep your Web design clean and simple. What are people there to do? Help focus that user interface on those tasks. Do not Puff up the Cheeks, Loll not out the tongue rub the Hands, or beard, thrust out the lips, or bite them or keep the Lips too open or too Close. A goofy avatar may express your personality and professionalism perfectly. Then again, it may not. Be no Flatterer, neither Play with any that delights not to be Play’d Withal. Don’t mindlessly RT, share or echo the insights of others. If you admire someone, tell them as much and share content because of its worth, not because of social gain. Read no Letters, Books, or Papers in Company but when there is a Necessity for the doing of it you must ask leave: come not near the Books or Writings of Another so as to read them unless desired or give your opinion of them unasked also look not nigh when another is writing a Letter. Think again before addictively checking your email or texting next to someone. If you have to, explain why it’s important. If you see someone else’s private messages, don’t comment unless invited to do so. Let your Countenance be pleasant but in Serious Matters Somewhat grave. Tune your speech, replies and links to the context of the conversation they are being shared within. The Gestures of the Body must be Suited to the discourse you are upon. Use language appropriate to the forum you are speaking within. In general, don’t post anything you wouldn’t want your mother to see. Reproach none for the Infirmities of Nature, nor Delight to Put them that have in mind thereof. Don’t mock anyone because of social facts, nor celebrate the mockery of others. Show not yourself glad at the Misfortune of another though he were your enemy. Don’t publicly celebrate the failures of competitors. When you see a Crime punished, you may be inwardly Pleased; but always show Pity to the Suffering Offender. Share the news of verdicts or fines but do so, if possible, with empathy. Do not laugh too loud or too much at any Public Spectacle. Share your humor, your goodwill and the reasons for it — but don’t overloard the stream of others. Superfluous Complements and all Affectation of Ceremony are to be avoided, yet where due they are not to be Neglected. Show respect for the time and experience of others. Use concise greetings and salutations in social messaging. Get to the point quickly. In Pulling off your Hat to Persons of Distinction, as Noblemen, Justices, Churchmen &c make a Reverence, bowing more or less according to the Custom of the Better Bred, and Quality of the Person. Amongst your equals, expect not always that they Should begin with you first, but to Pull off the Hat when there is no need is Affectation, in the Manner of Saluting and resaluting in words keep to the most usual Custom. Introduce yourself or provide context when initiating a conversation. Treat each person you encounter with respect, until evidence to the contrary is introduced. You can learn from anyone, even if it’s how not to do something. Tis ill manners to bid one more eminent than yourself be covered as well as not to do it to whom it’s due. Likewise he that makes too much haste to Put on his hat does not well, yet he ought to Put it on at the first, or at most the Second time of being asked; now what is herein Spoken, of Qualification in behavior in Saluting, ought also to be observed in taking of Place, and Sitting down for ceremonies without Bounds is troublesome. Relatively, it’s worse manners to remind someone else of a lack of netiquette than whatever deficiency they are showing. Observe proper netiquette when ever entering a conversation, especially when social messages are broadcast to an audience that is unfamiliar with you. Look around to see what the established norms for appearance and speech are on a given platform before contributing. If any one come to Speak to you while you are are Sitting Stand up though he be your Inferior, and when you Present Seats let it be to every one according to his Degree. Respond to @replies, comments and direct messages, if you can. Respect and offer thanks for whomever has taken the time to offer an opinion, with the singular exception of spammers. When you meet with one of Greater Quality than yourself, Stop, and retire especially if it be at a Door or any Straight place to give way for him to Pass. If you cite the insights or build on the ideas of a bonafide online authority, make sure you link to him or her. Web karma comes around. In walking the highest Place in most Countries Seems to be on the right hand therefore Place yourself on the left of him whom you desire to Honor: but if three walk together the middest Place is the most Honorable the wall is usually given to the most worthy if two walk together. At conferences, offer the best viewing angles to those who plan to livestream. Share access to outlets. If any one far Surpasses others, either in age, Estate, or Merit yet would give Place to a meaner than himself in his own lodging or elsewhere the one ought not to except it, So he on the other part should not use much earnestness nor offer it above once or twice. Be gracious in all areas of netiquette, especially to all those, young or old, who are new to a medium or platform. If you receive invitations to betas, try to pass them to those who will actually test the services. To one that is your equal, or not much inferior you are to give the chief Place in your Lodging and he to who ‘is offered ought at the first to refuse it but at the Second to accept though not without acknowledging his own unworthiness. Make sure it’s easy for everyone to comment upon or share your content. Always attribute to the original source of a link, photo, tweet or story with a hat tip and link. They that are in Dignity or in office have in all places Precedency but whilst they are Young, they ought to respect those that are their equals in Birth or other Qualities, though they have no Public charge. Founders of companies or other “c-level” executives have the final say in most matters and merit respect. That said, on the Internet, netizens can be from any age, creed or station. An opinion or perspective can have merit on its own, regardless of the source. It is good Manners to prefer them to whom we Speak before ourselves, especially if they be above us with whom in no Sort we ought to begin. Listen first and give others the opportunity to express a perspective, especially if his or her expertise on a topic exceeds your own. Let your Discourse with Men of Business be Short and Comprehensive. Get to the point, especially with VCs, CIOs or other business executive. Have an elevator pitch memorized, and a goal for meetings. Artificers & Persons of low Degree ought not to use many ceremonies to Lords, or Others of high Degree but Respect and highly Honor them, and those of high Degree ought to treat them with affability & Courtesy, without Arrogance. Writers or authors that have earned authority should be respected but not fawned over. Likewise, people in those positions should neither dismiss commenters nor fail to mentor young talent. In speaking to men of Quality do not lean nor Look them full in the Face, nor approach too near them at lest Keep a full Pace from them. Don’t cyberstalk Web celebrities – or general celebrities and business personalities, for that matter. Everyone deserves privacy, especially with respect to family. In visiting the Sick, do not Presently play the Physician if you be not Knowing therein. Suggesting drugs or treatments for others online if you are not a physician isn’t recommended. Generally, even doctors will not make diagnoses or treatment recommendations without an in-person examinations. Social media may create new outlets for healthcare. Sharing personal experiences with treatments, diseases or physicians may be helpful. Using online platforms always should be done with an eye towards preserving electronic privacy. In writing or Speaking, give to every Person his due Title According to his Degree & the Custom of the Place. If you are writing about others, take the time to properly spell names, titles and identify employers or other affiliations, preferably with a link to a biography. Strive not with your Superiors in argument, but always Submit your Judgment to others with Modesty. Focus on presenting solutions to problems, not in assigning blame. Always look for ways to elevate the good ideas of others. Undertake not to Teach your equal in the art himself Professes; it Savours of arrogance. Don’t remind savvy bloggers or published authors how to write. If you see a mistake in a link or copy, point it out with tact and, if possible, privacy. Everyone makes mistakes. Let thy ceremonies in Courtesy be proper to the Dignity of his place with whom thou converses for it is absurd to act the same with a Clown and a Prince. Adopt the conventions of whatever online forum you are in, keeping in mind basic codes of online conduct. Don’t be shocked if gamerspeak about fragging & “n00bs” doesn’t go over well in a healthcare debate. Do not express Joy before one sick or in pain for that contrary Passion will aggravate his Misery. Be mindful about celebrating business successes or promoting sports and entertainment news during moments of national tragedy. When a man does all he can though it Succeeds not well blame not him that did it. Recognize good faith efforts to contribute something of value, even if the end result falls short of the quality required. Being to advise or reprehend any one, consider whether it ought to be in public or in Private; presently, or at Some other time in what terms to do it & in reproving Show no Sign of Cholar but do it with all Sweetness and Mildness. Look for ways to correct behavior or express your displeasure in a direct message or email, as opposed to a comment, unless such public commentary serves the greater common good of an online community. Look for ways to lead with a compliment, if possible. Take all Admonitions thankfully in what Time or Place Soever given but afterwards not being culpable take a Time & Place convenient to let him him know it that gave them. Accept constructive criticism of your words or actions with grace. If you were not at fault for a given outcome, follow up to explain why and suggest a resolution, if possible. Mock not nor Jest at any thing of Importance nor make Jests that are Sharp Biting, and if you Deliver any thing witty and Pleasant abstain from Laughing thereat yourself. For the few topics don’t lend themselves well to humor, abstain. For the rest, look ways to joke that aren’t demeaning, cruel nor mocking. If you do deliver a perfect one-liner, don’t repeat it until it isn’t funny anymore. Wherein you reprove Another be unblameable yourself; for example is more prevalent than Precepts. If you’re going to publicly critique another’s social media use, be mindful of whether you’ve made the same mistake. If so, be helpful tactfully. Use no Reproachful Language against any one neither Curse nor Revile. Skip the curses, misogyny, racism or any other sort of ‘isms that come to mind. Be not hasty to believe flying Reports to the Disparagement of any. Follow rumors, bad news & smears to a primary source to judge validity, particularly before sharing them with your network. Alternately, quote attribution for such news, allowing your audience the opportunity to debunk it. Wear not your Cloths, foul, ripped or Dusty but See they be Brushed once every day at least and take heed that you approach not to any Uncleaness. Make sure to take a good, clear picture for your avatar. Or use high resolution logos for a corporate identifier. Check your blog or profile pages against multiple browsers make sure templates or CSS code display correctly. In your Apparel be Modest and endeavor to accommodate Nature, rather than to procure Admiration. Keep to the Fashion of your equals Such as are Civil and orderly with respect to Times and Places. Stay away from busy backgrounds, garish color schemes or eye-popping animations. Assume users will be browsing your content on mobile browsers, too. Observe Web standards for accessibility. Run not in the Streets, neither go too slowly nor with Mouth open go not Shaking your Arms kick not the earth with R feet, go not upon the Toes, nor in a Dancing fashion. Don’t overwhelm your followers or audience with status updates or banal content. Focus on being useful, not being first. Play not the Peacock, looking every where about you, to See if you be well Decked, if your Shoes fit well if your Stockings sit neatly, and Cloths handsomely. Be considered about adopting the newest trend in avatars or adding so many widgets or script to a page. Load time matters. Eat not in the Streets, nor in the House, out of Season. Be thoughtful about sharing sports news or spoilers from highly anticipated movies until the next day. Associate yourself with Men of good Quality if you Esteem your own Reputation; for ‘is better to be alone than in bad Company. We are informed by those we follow. We are defined by those who follow us. In walking up and Down in a House, only with One in Company if he be Greater than yourself, at the first give him the Right hand and Stop not till he does and be not the first that turns, and when you do turn let it be with your face towards him, if he be a Man of Great Quality, walk not with him Cheek by Joul but Somewhat behind him; but yet in Such a Manner that he may easily Speak to you. When commenting on a blog, in a distribution group or other forum, make sure to read the comments of others before you. Take time to read the post itself and comment meaningfully. Acknowledge good contributions and make sure that your comment doesn’t simply echo others or ignore facts that controvert the original post. Never express anything unbecoming, nor Act against the Rules Moral before your inferiors. Keep in mind that your comments on social media platforms ma reflect upon your employer. They will certainly reflect upon you should you be seeking employment. Be not immodest in urging your Friends to Discover a Secret. If you need help learning something, make sure it isn’t a fact that can be learnt through a simple search of the Web. Utter not base and frivolous things amongst grave and Learned Men nor very Difficult Questions or Subjects, among the Ignorant or things hard to be believed, Stuff not your Discourse with Sentences amongst your Betters nor Equals. Tailor your language and references to the conversations you are engaged within, focusing on expressing your point in as few words as possible. Speak not of doleful Things in a Time of Mirth or at the Table; Speak not of Melancholy Things as Death and Wounds, and if others Mention them Change if you can the Discourse tell not your Dreams, but to your intimate Friend. Death, taxes and war are facts of life. That said, constant reminders of them may not endear you to others unless you’re, say, a war journalist, IRS agent or ER doc. A Man ought not to value himself of his Achievements, or rare Qualities of wit; much less of his riches Virtue or Kindred. Bragging is rarely attractive. Focus on being useful and relevant, not on sharing what you’ve done or how smart you are, much less your net worth or family connections. Break not a Jest where none take pleasure in mirth. Laugh not aloud, nor at all without Occasion. Deride no mans Misfortune, though there Seem to be Some cause. Jokes without context don’t work well. It’s easy to mistake sarcasm for cruelty. Humor isn’t welcome in every context. Writing “LOL” also may not convey professionalism, though the need for that is also contextual. Speak not injurious Words neither in Jest nor Earnest Scoff at none although they give Occasion In general, avoid trashing your company, coworkers or other services in public. HR departments can and will use those comments to pre-screen you. Legitimate issues can easily be expressed constructively and are much more likely to be resolved by doing so. Be not froward but friendly and Courteous; the first to Salute hear and answer & be not Pensive when it’s a time to Converse. Approach each conversation with positivity. It comes through. Listen to what people are saying about you and thank others for their compliments. Everyone uses social media differently. Go not thither, where you know not, whether you Shall be Welcome or not. Give not Advice without being Asked & when desired do it briefly. Use PowerTwitter to expand small URLs to avoid phishing or malware. Be mindful of tracking cookies and virus-infected sites, or of allowing unfamiliar third-party Facebook apps access to your data. Thinking before clicking. If two contend together take not the part of either unconstrained; and be not obstinate in your own Opinion, in Things indifferent be of the Major Side. Argue constructively. Try to understand what someone else’s position or grievance is thoroughly before stating your own position. Take debates that are not helpful to the public private. Reprehend not the imperfections of others for that belongs to Parents Masters and Superiors. Be helpful, not critical. Be useful, not scornful. Karma can be rough. Gaze not on the marks or blemishes of Others and ask not how they came. What you may Speak in Secret to your Friend deliver not before others. Humans are by nature imperfect beings. Highlighting the physical, emotional, spiritual or relational imperfections isn’t likely to endear one over time. Avoid “DM fails” at all cost; don’t write anything on a social network, protected or not, that you wouldn’t want everyone to read. Cut and paste is easy. Speak not in an unknown Tongue in Company but in your own Language and that as those of Quality do and not as the Vulgar; Sublime matters treat Seriously. Write in the language that others in a conversation are using. Use translators integrated into the Web to aid the effort, or the feature in Tweetdeck that does the same. Avoid cursing. Think before you Speak pronounce not imperfectly nor bring out your Words too hastily but orderly & distinctly. Self-edit and spellcheck twice before hitting send. Get to the point with the best words possible. If you’re podcasting or video blogging, take the time to annunciate. When Another Speaks be attentive your Self and disturb not the Audience if any hesitate in his Words help him not nor Prompt him without desired. Interrupt him not, nor Answer him till his Speech be ended. Listen first. Read your @replies and comments and, if possible, respond. Wait a beat on webinars and podcasts to ensure that speakers don’t cross over (and to make editing easier). In the midst of Discourse ask not of what one treateth but if you Perceive any Stop because of your coming you may well intreat him gently to Proceed: If a Person of Quality comes in while your Conversing it’s handsome to Repeat what was said before. Put answers to public question in context; one half a conversation is a challenge. If someone joins a conversation with something substantive to say, offer a quick summary to get him or her up to speed – or provide a link to the thread. While you are talking, Point not with your Finger at him of Whom you Discourse nor Approach too near him to whom you talk especially to his face. Don’t poke or nudge people. Seriously. Just talk to them. Treat with men at fit Times about Business & Whisper not in the Company of Others. Focus on sharing hard news that you want to see read on Monday – Thursday mornings. Soft news will play better in the weekends, particularly on sports, entertainment and gaming. Make no Comparisons and if any of the Company be Commended for any brave act of Virtue, commend not another for the Same. Share links liberally and equitably. If you have a broad audience, try to share the views of those who don’t. Be not apt to relate News if you know not the truth thereof. In Discoursing of things you Have heard Name not your Author always A Secret Discover not. Confirm a link goes to where it says it does before sharing it. If your job is to curate news, make it clear where something is sourced and attribute/quote accordingly. Don’t pass on unattributed, unsourced rumor, especially if it’s by anonymous sources. Cultivate a network that does the same. Trust is currency. Be not Tedious in Discourse or in reading unless you find the Company pleased therewith. Get to the point, both in writing and speaking. Save the 9,000 word rants for a personal blog you aren’t depending upon professionally. Be not Curious to Know the Affairs of Others neither approach those that Speak in Private. Don’t hack into the servers or Web accounts of others. If you find digital identities or sensitive data online, whether on a P2P site or other board, don’t publish it for profit. Respect the privacy of others. Undertake not what you cannot Perform but be Careful to keep your Promise. Your word is your bond. If you commit to work, meet that expectation. Don’t overpromise and underdeliver. When you deliver a matter do it without Passion & with Discretion, however mean the Person be you do it too. When it comes to controversial news, if you choose to pass on news, stick to the facts. If you don’t, understand you’re going to segment or outright lose some audience. When your Superiors talk to any Body hearken not neither Speak nor Laugh. Save unconstructive criticism of a boss for offline discussions. (Or skip it entirely.) Don’t tweet or update anythiing you wouldn’t want him or her to read.. After all, forgetting that you’ve friended a superior can be worse than embarrassing. In Company of these of Higher Quality than yourself Speak not til you are asked a Question then Stand upright put of your Hat & Answer in few words. If you’re going to ask a celebrity, politician or busy executive a question, listen first to how or she uses a platform and consider whether an answer is likely. If so, be informed, be polite and get right to the point. In Disputes, be not So Desirous to Overcome as not to give Liberty to each one to deliver his Opinion and Submit to the Judgment of the Major Part especially if they are Judges of the Dispute. If you’re using social media for a dialogue, as opposed to a monologue, make sure to actually listen to the responses of others. Is your aim to “win the argument” or to get to the truth of the matter being discussed. If the consensus of a community supports a policy decision that you disagree with, voice the difference of opinion with clarity, respect and evidence supporting your contention. An uniformed majority isn’t always right in the long run. Let thy carriage be such as becomes a Man Grave Settled and attentive to that which is spoken. Contradict not at every turn what others Say. During meetings, be aware that updating a service or focusing on the social media backchannel instead of those present is often a breach of etiquette. Face to face meetings are too valuable to damage the relationship by prioritizing any request that can wait. Listen first, reply with context. And don’t always take a contrary position. Be not tedious in Discourse, make not many Digressions, nor repeat often the Same manner of Discourse. Keep your copy short and your voice messages even shorter. Brevity is a vertue. Focus on the topic at hand and what you want the reader to take away. Avoid redundancy. Speak not Evil of the absent for it is unjust. Posting unconstructive criticism or personal attacks to conference backchannels reflects more poorly upon the writer than the speaker. Being Set at meat Scratch not neither Spit Cough or blow your Nose except there’s a Necessity for it If you’re out to dinner with friends, family or colleagues, focusing too frequently on your smartphone may be regarded in the same way as spitting or burping loudly. Make no Show of taking great Delight in your Victuals, Feed not with Greediness; cut your Bread with a Knife, lean not on the Table neither find fault with what you Eat. Unless you’re a chef or food critic that adds a lot of flavor to the update, reconsider updating social media platforms with whatever you’re eating. Notable meals deserve recognition, just like good books, movies or any other media form you “consume,” but banal updates about eating humdrum food aren”t likely to endear you to friends. Take no Salt or cut Bread with your Knife Greasy. Don’t use smartphone touchscreens after eating pizza, fries or other greasy fast good. Especially the devices of others. Entertaining any one at the table, it is decent to present him with meat; Undertake not to help others undesired by the Master. Unless the circumstance demands extra security or privacy, make it easy for visitors to register to comment or view content. Once acquired, don’t pass out your login credentials to other parties. If you Soak bread in the Sauce, let it be no more than what you put in your Mouth at a time and blow not your broth at Table but Stay till Cools of it Self. Avoid directly linking to large media files on social media platform unless you offer clear information to readers concerning what users may be clicking upon. Put not your meat to your Mouth with your Knife in your hand neither Spit forth the Stones of any fruit Pie upon a Dish nor Cast anything under the table. Don’t spam the comments of blogs with unrelated links or simply to promote a product or service. Don’t flood a popular hashtag on Twitter or a Facebook group with links to a similar service, especially if it’s unrelated to the topic. It’s unbecoming to Stoop much to ones Meat. Keep your Fingers clean & when foul wipe them on a Corner of your Table Napkin. Be aware of both posture and keyboard position. Logging many of typing without care puts you at increased risk of repetitive strain injuries. Put not another bit into your mouth till the former be swallowed. Let not your morsels be too big for the jowls. Wait for a while between updates, especially if you’re in charge of curating an organization’s content. On Twitter, that might be 15 minutes. On Facebook, the ideal may be closer to 60-90 minutes, at least for NPR. Drink not nor talk with your mouth full; neither gaze about you while you are drinking. Don’t update social media platform when you’re drunk. Unless you want uncomfortable publicity about drunk tweets. Drink not too leisurely nor yet too hastily. Before and after drinking, wipe your lips; breath not then or ever with too great a noise, for its uncivil. If a fact seems doubtful, out of place for a user or it’s a breaking news story, take a moment to validate the link and the source before passing it on. Getting it right should often trump posting it first. Cleanse not your teeth with the table cloth napkin, fork, or knife; but if others do it, let it be done without a peep to them. If you see a breach of social media etiquette, bad link or copy error, try to alert the author to it discretely if possible. Rinse not your mouth in the presence of others. Take the necessary steps to secure email accounts that control your social media accounts or, says, DNS settings. It is out of use to call upon the company often to eat; nor need you drink to others every time you drink. Begging for links, retweets or only promoting your own work is neither welcome nor community-minded. Share the best of what others have written or advised. Look for opportunities for reciprocity. In the company of your betters, be not longer in eating than they are; lay not your arm but only your hand upon the table. If you’re participating in a roundtable or moderating a chat, give equal time to the contributions of contributors. It belongs to the chiefest in company to unfold his napkin and fall to meat first, but he ought then to begin in time & to dispatch with dexterity that the slowest may have time allowed him. If influential members of a community are given prefential access to the Web, power outlets or other resources in scarcity, offering others the opportunity to log on, charge up or ask questions is an admirable courtesy. Be not angry at the table whatever happens & if you have reason to be so, show it not; put on a cheerful countenance especially if there be strangers, for good humor makes one dish of meat a feast. Avoid recording video in the heat of an angry moment. If you’ve been treated poorly by an organization, don’t take it out on a online representative if he or she isn’t personally at fault. Offering candid, constructive and critical reviews of bad service, faulty products or unprofessional is beneficial for consumers. Couching feedback in good humor is generally welcome. Set not yourself at the upper of the table; but if it be your due or that the master of the house will have it so, contend not, least you should trouble the company. If you’re given special treatment, a beta invite or a prototype of the year’s hottest widget, be humble about it. Share details that inform others, as opposed to celebrating privilege. If others talk at the table, be attentive but talk not with meat in your mouth. If you’re participating in a podcast or chat, wait a second or two after others speak to allow for easier editing. When you speak of God or his attributes, let it be seriously & with reverence. Honor & obey your natural parents although they be poor. If you must discuss religion in online forums, be respectful and tolerant of differing views. If you become friends with your parents on social networks, be kind: keep submissions to MyParentsJoinedFacebook anonymous. Let your recreations be manful not sinful. Lean towards offline activities that inform that mind, enliven the spirit or energize the body. There’s a bonafide Twitterstorm on today after a post from Twitter co-founder @Biz Stone indicated that the service would be changing the way it handled @replies. Just check out #fixreplies. We’ve updated the Notices section of Settings to better reflect how folks are using Twitter regarding replies. Based on usage patterns and feedback, we’ve learned most people want to see when someone they follow replies to another person they follow—it’s a good way to stay in the loop. However, receiving one-sided fragments via replies sent to folks you don’t follow in your timeline is undesirable. Today’s update removes this undesirable and confusing option. Spotting new folks in tweets is an interesting way to check out new profiles and find new people to follow. Despite this update, you’ll still see mentions or references linking to people you don’t follow. For example, you’ll continue to see, “Ev meeting with @biz about work stuff” even if you don’t follow @biz. We’ll be introducing better ways to discover and follow interesting accounts as we release more features in this space. We’re getting a ton of extremely useful feedback about yesterday’s update to Settings. The engineering team reminded me that there were serious technical reasons why that setting had to go or be entirely rebuilt—it wouldn’t have lasted long even if we thought it was the best thing ever. Nevertheless, it’s amazing to wake up and see all the tweets about this change. We’re hearing your feedback and reading through it all. One of the strongest signals is that folks were using this setting to discover and follow new and interesting accounts—this is something we absolutely want to support. Our product, design, user experience, and technical teams have started brainstorming a way to surface a new, scalable way to address this need. Please stay tuned and thank you again for all the feedback. Talk about real-time feedback and response! I’d like to hear more about the technical reasons behind the change. Add RE to the beginning of your tweets in front of a given username. Since, as Laura “@pistachio” Fitton pointed out this morning, @replies were a community generated convention, it’s quite straightforward to continue that practice and introduce a way of indicating to everyone that you are are @replying to someone. At some point, stats wizards can pull out who gets the most RE @ them, just like they have analyzed the RT (retweet). In the meantime, this will “surface” a person for everyone. And, since Twitter and other clients automatically now default to “@mentions” instead of direct replies, we can keep on chatting. RE is all of two characters to add, plus a space. Yes, 3 spaces out of 140 is a bit dear, but in this writer’s opinion they are worth adding to buck the filter. I’ve posted a comment on the Top 15 Twitter Acronyms to add RE to the list. I hope that RE catches on, as I’d really miss those snippets of conversation. dana boyd kicked off a discussion on the ROI of social media in Cambridge with a rapid-fire, necessarily abridged keynote on the history of social networks and their associated digital ethnographies in the United States. dana boyd presented on her research (available at zephoria.org/thoughts). A longer version of her presentation. “Living and Learning with Social Media,” is available online, though without the pretty pictures. One clear distinction boyd made was between social network websites and social networking sites. The former are distinctly not about finding jobs; they’re about finding communities of interest. When rhetorically discussing how social network sites gained traction in the US, boyd cited the network effects created by these self-organizing communities of interest. When she looked back at the history of these communities, she started with Friendster. (Paul Gillin noted Classmates.com as the first in “Why people love social networks“earlier this week). Friendster, as boyd noted, was designed to be online dating. The three original demographics that populated it were gay men, the “digerati,” and 20-something hipsters that cycle around the playa — aka “burners” at Burning Man. The trouble Friendster’s leadership found is that “Fakesters started popping up.” These fake profiles, of bands, places or really anything that wasn’t an authentic person with a personal profile, were seen as polluting the community — at least by Friendster’s leadership. They tried to stop it and were faced by a rebellion. The infusion of Fakesters was followed by another wave: indie rock bands that wanted to connect with fan. Both, in boyd’s words,’ fueled the ire of Friendster and were encouraged to leave. And, in quick order, the early adopters left, moving to Tribe.net or, in the case of those musicians, to Myspace. Facebook’s introduction followed soon there after, growing meteorically since then, alongside of MySpace. As Boyd noted, however, along with that growth came a series of “digital panics” over culture and risk as embodied in these social networks. The assumption tended to be that MySpace was about social deviance and sexual meetups, an image that was fueled by sensational reports of sexual predators and exploited teends in the media. Part of this was a division of between Facebook and MySpace in the US that boyd had famously written about in “Viewing American class divisions through Facebook and MySpace” and her subsequent response. Boyd’s dissertation, “Taken out of context,” deals with precisely this issue. The castes and tribes called out aesthetic differences between the two massive social networks but, as boyd pointed out this was about class. As played out in media, this lens shaped how we understood them, though the websites were functionally and practically quite similar. For those look for ways looking for ways, to measure the utility or effectives of social networks, Zephoria suggests measuring network density. Look at the activity of clusters. Look at stickiness. If someone is using it but none of his or her friends are, they aren’t likely to stick around. Look for way to measure the health of the community – not just individuals. When discussing the differences betwen adults and teens, boyd sees fundamentally different cultural, socioeconomic and power structures in play. Teen conversations can look inane from the outside — at best. boyd suggests thinking of them as hallway conversations, part of the process of “digital social grooming.” As she notes, you can have isolated kids in the corner offline too. Wall posts on Facebook are, in her eyes, simply forms of ritualistic hallway talk. As knowledge workers joined Facebook, they started hanging out with friends — but what they did there was fundamentally different than the teens. Adult are much more likely to create status messages that broadcast outwards, while their “About me” sections are basically resumes, rarely offering up to date bits. Teens are more likely to include what they want friends to know about now. boyd also noted they way that social media is shifting, including the relevant demographic. The median age of Twitter, for instance, is 31 and shifting higher. Teens aren’t engaging with the site at all. As boyd wryly noted, “for some reason, it’s more the Demi Moore” crowd. Virtual worlds didn’t escape notice. When asked about how social network mixed, boyd first refined the question: “anything that allows us to create social space w/avatars” vs 3D immersive online environments. She noted that teenagers aren’t using Second Life but are using console or online gaming environments to escape and have fun. Such world necessarily require real-time synchronous interaction, which is quite powerful for those who can get online at the same time to play, say, World of Warcraft. Given that mobile phones are still the number one way to get online, however, there are inherent limits. (That could change if WoW really does work well on the iPhone). Virtual worlds therefore require “dumbing down” or different access patterns. And, in fact, boyd said that “70% of teenagers share the password for their social networking sites with their friends” so that their virtual identities could be curated by others. For the security-minded, this is of course anathema, but for a teenage member of a digital tribe, this is apparently close to the norm. boyd talked about other cultural differences that vary by country and platform. Cyworld, for instance, a social network in Asia, is shared family experience. She notes that micropayments are working in Cyworld, sometimes in unexpected ways. “You can buy poop on a friend’s profile, which they then have to pay to clean up.” When she noted that she would “like to see that on LinkedIn,” the audience enjoyed a chuckle. More seriously, however, she observed that as long as teenagers are part of an “oppressed demographic” in the US, our social networks won’t be like Asia. The US market is just beginning to get “all you can eat text messaging plans.” She suggested that the audience “consider the weirdness of someone else having to PAY to receive your message” and the worst cases where cyberbullies blasts someone w/txts, incurring costs. In closing, boyd noted that social networks and social media in general are here to stay. As we all create our digital identities, teens and adults alike are aware of the reality of “invisible audiences” that require us to adjust our projections to those who might see us. Once of the central challenges of social media use is how we adjust in the absence of social cues when the rules are still a moving target. The numerous firings that have now occurred after poorly-considered status updates bear witness to this reality. Firing is relatively minor compared to consequences elsewhere, as boyd noted in the the example of journalists in China. They write at two different levels to escape the censors to convey information. When I scrolled down this blog this afternoon, I noticed that my list of Delicious social bookmarks was a succinct, useful snapshot of the resources or ideas I’d found worth saving over the past week. As the platform and tools that I can use to tag, share or store information online has expanded, Delicious has remained an important tool for leaving useful digital breadcrumbs I can use to retrace my travels later on. This list struck me as particularly meaningful, both because of how useful the links are and what they reflect in the moment of my life when I saved them. For instance, I saved the Google AdWords: Keyword Tool link after I enjoyed quick workshop with my SEO guru. I use it whenever I blog or write. The link needed to be in my bookmarks. I’ve been exploring new ways to syndicate and share digital content for years. The Top 20 Ways to Share a Great Blog Post at Mashable put most of them in the same place. Score. I found Classroom 2.0 looking for information about how collaborative software is being use in education. Classroom 2.0 is a social network for “those interested in Web 2.0 and collaborative technologies in education.” Perfect. I came across an anonymous blogging guide provided by Global Voices, “Global Voices Advocacy » Anonymous Blogging with WordPress & Tor,” through an email from the Berkman Center at Harvard Law School. It’s an important resource for any journalist or citizen in repressive regimes that need to get information out but can’t risk being identified. Given the enormous risks to life, liberty and family dissidents face for in many parts of the globe, I wanted to make sure I saved it to review again later. Flash drive + Tor + WordPress = Anonyblogging. Smart. I’d come across Tweet Congress before. It’s a visible element of an online movement to get Congress on Twitter. As the site notes, “Twitter enables real conversation between lawmakers and voters, in real time.” We’re all seeing it already, as Congressional staffs, Senators and Representatives adjust to the new dynamic. There’s no need for a TweetWhitehouse, as @BarackObama is already back in use again. I’ve been reading and thinking a lot about the future of online news, newspapers and digital journalism. One of the thinkers I read the most and certainly use as a hub for information is Jay Rosen, a journalism professor at NYU. His list of 12 essays to read, a “Flying Seminar In The Future of News,” is a must-read on the topic. I tagged Utimaco’s compliance and regulation portal after I attended on a seminar they hosted on the new MA data protection law. I wrote about what I learned there on SearchCompliance.com: Panels reveal risks of noncompliance with Mass. laws. 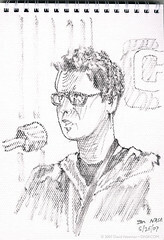 I saved Bostonist’s post @ Boston’s First Official Google Meetup because Tom Lewis recorded a short interview with me at the event. I embedded it below. One of the starkest, clearest headlines I’ve read recently was on Washington Post.com: Daily Red Meat Raises Chances Of Dying Early. The link text really says it all. Google Moderator rounds out this “top 10” because of its use by the WhiteHouse in soliciting questions before the recent online town hall. I’d tweeted about the TipJar before, where users can rate “money saving tips submitted and ranked by the Web community.” I learned at the Google Meetup in Boston that Google itself uses the moderation tool every Friday internally. I don’t usually reblog Delicous links — this was just a helluva good week for ’em. If you use delicious, share similar interests and would like to extend your network, you can find me at delicious at http://delicious.com/alexanderbhoward.